It is pretty simple – we save consumers money, we save oil and we reduce waste. We take the customers empty & not printing inkjets, which otherwise would be discarded as trash, inject the appropriate amount of new ink, clear nozzles where necessary: thus allowing them to print again. i Fill Inkjets have been helping consumers recycle since January 2005. To date we have refilled over 350,000 cartridges: which keeps 80 large grocery carts of solid waste out of landfills and saves over 6000 gallons of oil. The price of our refilled cartridges is about 50% of new OEM retail. Since 2005 consumers have saved approximately $3.5 million. i Fill Inkjets is convenient with over 100 locations in 6 NE states. Everyone prints, the ink market is huge and there are a lot of empty cartridges out there. All refilled cartridges are 100% guaranteed for quality and quantity. REUSE is the PUREST form of RECYCLING. You SAVE 50%! For some of the same reasons you wouldn’t throw your car away when you run low on gas. Not only would that be incredibly expensive, but I’m sure you can envision the environmental disaster that would quickly occur. For sure the scale is much smaller both in terms of costs and size, but the fact is…there’s often no reason to throw your cartridge away when it’s out of ink. 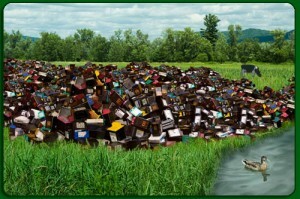 Over 300 million ink-jet cartridges being thrown out each year creates one huge mountain of unnecessary trash! Make the choice to have your cartridges expertly refilled at i FIll Inkjets, and you’ll not only feel good about helping our environment, but you’ll certainly feel good about the savings you’ll pocket. Now you don’t have to throw out your expensive printer cartridges. We can reliably refill ink-jet cartridges manufactured by all the major brands…including Dell. That means that owners of Dell printers can enjoy the convenience and cost savings offered by i Fill Inkjets without the hassle of online ordering. We refill most ink-jet cartridges for all major brands at our over 100 locations. No matter the brand of printer, we refill…you save! We also can provide remanufactored (refilled) TONER cartridges for toner users, call 518-459-5382 for additional details. Ask about those Laser Toner Savings! You can call 518-459-5382 for pricing and availability.